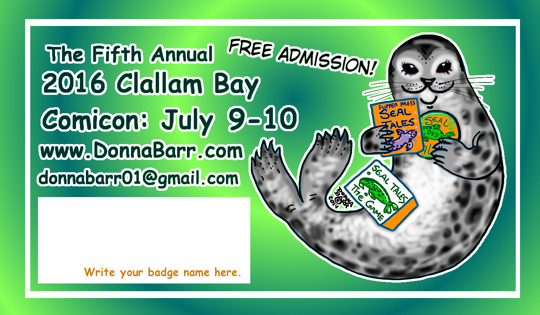 July 9-10: During and after Clallam Bay/Sekiu Fun Days 10:00 am - 5 pm both Saturday and Sunday. EVERYONE WELCOME. If it's pretty or they can eat it, bring it. Facebook Events Link HERE. Use to organize events and exchange information. DEALER TABLES: $25 (27.00 through Paypal). Contact at: donnabarr01 at gmail dot com. Dealer and panelist contracts: THIS PAGE. Payment cancellation deadline is May 1, 2016. You are expected to know your professional and licensing obligations for food sales or use of fire. Parents, please note your obligations. Panels held at front of the hall in round-table format. Participants will clean and straighten hall after show closes Sunday; keep the Lion's club happy. 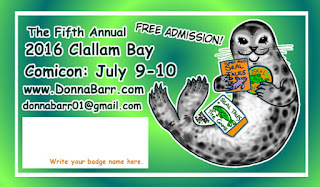 1: Donna Barr's A Fine Line Press AND Clallam Bay Comicon Central. 2. Special Guest Leanne Franson. 4. Roberta Gregory. The classic Northwest artist will be here! The newly renovated building - nice job, Lions! AWARDS: Your fans are your award. We don't get to say. Special guests: all we can offer you is a deductible beach vacation, at the kind of old-fashioned con where the author/fan/friend were - and are here - the first priority. OFFICIAL CONVENTION B&B: Winter-Summer Inn Bed and Breakfast 360 963 2264 The 3 lower rooms are being held for the convention. The deadline is February 11. Tell Owner Sandy Tsiang you are with the comicon, or you may be turned away. The upper suite is available to anybody, and there is no deadline on reserving it. COMICON EATS: Dealers and panelists: we have a kitchen, with stove and refrigerator. You're welcome to use them. Keep it clean. Potlucks welcome. HOW TO GET HERE: Airline: Kenmore Air Airporter: Olympic Bus Lines from Seattle. Once in Port Angeles: take the Forks bus to the the Clallam Bay connection at Sappho; Bus details at Clallam Transit. 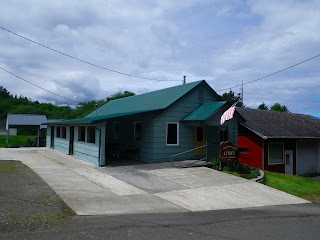 From Seattle: Ferries, drive to Port Angeles, then either highway 101 (113-112) or 112 to Clallam Bay. Carpooling: organize on the Facebook page. FACILITY CARE: No tape of any sort on the wall. Respect the Lion's Club's wall displays. We all chip in to clean up at the end of the show. It don't take long. LEGAL NOTES: Donna Barr is the ONLY Comicon staff. No one else has any access to official comicon decisions. Clallam County "Comicon" a Good Try. And Fun!